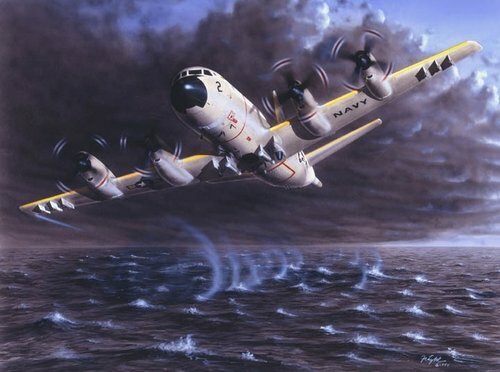 The Lockheed P-3 Orion is a four-engine turboprop, anti-submarine warfare (ASW), long endurance, land-based maritime surveillance aircraft, developed for the United States Navy and was first operational for the United States Navy in 1962. The P-3C first entered service in 1969 and has been continuously upgraded and updated with new avionics systems and mission equipment. The aircraft is flown by a crew of ten on missions up to 14 hours long and can carry various weapons in the bomb bay and on ten underwing pylons. A total of 734 P-3s were built between 1960-1990 with about 435 aircraft still operating worldwide by 21 governments and agencies in 17 countries. In 2012 it joined the handful of military aircraft that included the Boeing B-52 Stratofortress, Boeing KC-135 Stratotanker and Lockheed C-130 Hercules that have served 50 years of continuous use by the United States military. The U.S. Navy's fleet of P-3C aircraft will continue to fly for the next decade and will gradually be replaced by the new P-8A Poseidon, a Boeing 737 variant, that began entering service in 2012. This colorful print represents the most recent version of the Lockheed P-3C Orion painted in the latest gloss gray scheme with original full-size color markings. 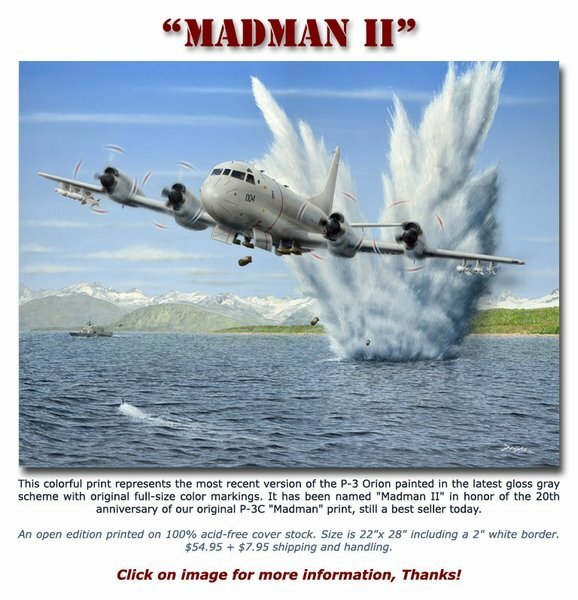 It has been named "Madman II" in honor of the 20th anniversary of our original P-3C "Madman" print, still a best seller today.